(c) make more informed judgements about the enterprise as a whole. 02. This Standard should be applied in complete sets of published financial statements that comply with Vietnamese Accounting Standards. 03. A complete set of financial statements includes a balance sheet, income statement, cash flow statement and notes, as provided in VAS 21 “Presentation of Financial Statements”. 04. This Standard should be applied by enterprises whose equity or debt securities are publicly traded and by enterprises that are in the process of issuing equity or debt securities in public securities markets. 05. If an enterprise whose securities are not publicly traded prepares financial statements that comply with Vietnamese Accounting Standards, that enterprise is encouraged to disclose financial information by segment voluntarily. 06. If an enterprise whose securities are not publicly traded chooses to disclose segment information voluntarily in financial statements, that enterprise should comply fully with the requirements of this Standard. 07. If a single financial report contains both consolidated financial statements of an enterprise whose securities are publicly traded and the separate financial statements of the parent or one or more subsidiaries, segment information need be presented only on the basis of the consolidated financial statements. If a subsidiary is itself an enterprise whose securities are publicly traded, it will present segment information in its own separate financial report. Operating activities are the principal revenue-producing activities of an enterprise and other activities that are not investing or financing activities. (e) the nature of the regulatory environment, for example, banking, insurance, or public utilities. (f) the underlying currency risks. A reportable segment is a business segment or a geographical segment identified based on the above-specified definitions. 10. A single business segment does not include products and services with significantly differing risks and returns. While there may be dissimilarities with respect to one or several of the factors in the definition of a business segment, the products and services included in a single business segment are expected to be similar with respect to a majority of the factors. 11. A geographical segment does not include operations in economic environments with significantly differing risks and returns. A geographical segment may be a single country, a group of two or more countries, or a region within a country. 13. An enterprise’s organisational and internal reporting structure will normally provide evidence of whether its dominant source of geographical risks results from the location of its assets (the location of its operations) or the location of its customers (the location of its sales). Enterprise uses organisational and internal reporting structure or the location of its assets or its customers to determine the geographical segments of its business. 14. Determining the composition of a business or geographical segment involves a certain amount of judgement of the enterprise management. In making that judgement, enterprise management takes into account the objective of reporting financial information by segment as set forth in this Standard and other Standards. (f) general administrative expenses, head-office expenses, and other expenses that arise at the enterprise level and relate to the enterprise as a whole. However, costs are sometimes incurred at the enterprise level on behalf of a segment. Such costs are segment expenses if they relate to the segment’s operating activities and they can be directly attributed or allocated to the segment on a reasonable basis. For a segment’s operations that are primarily of a financial nature, interest income and interest expense may be reported as a single net amount for segment reporting purposes only if those items are netted in the consolidated or enterprise financial statements. Segment result is segment revenue less segment expense. Segment result is determined before any adjustments for minority interest. Segment assets are those operating assets that are employed by a segment in its operating activities and that either are directly attributable to the segment or can be allocated to the segment on a reasonable basis. If a segment’s segment result includes interest or dividend income, its segment assets include the related receivables, loans, investments, or other income-producing assets. Segment assets do not include deferred tax assets. Segment assets are determined after deducting related allowances that are reported as direct offsets in the enterprise’s balance sheet. Segment liabilities are those operating liabilities that result from the operating activities of a segment and that either are directly attributable to the segment or can be allocated to the segment on a reasonable basis. If a segment’s segment result includes interest expense, its segment liabilities include the related interest-bearing liabilities. Segment liabilities do not include deferred tax liabilities. Segment accounting policies are the accounting policies adopted for preparing and presenting the financial statements of the consolidated group or enterprise as well as those accounting policies that relate specifically to segment reporting. 16. The definitions of segment revenue, segment expense, segment assets, and segment liabilities include amounts of such items that are directly attributable to a segment and amounts of such items that can be allocated to a segment on a reasonable basis. An enterprise looks to its internal financial reporting system as the starting point for identifying those items that can be directly attributed, or reasonably allocated, to segments. 17. A revenue, expense, asset, or liability should not be allocated to segments for internal financial reporting purposes on a basis that could be deemed subjective or arbitrary. Such an item should be allocated reasonably pursuant to the definitions of segment revenue, segment expense, segment assets, and segment liabilities in this Standard. 18. Segment assets include current assets that are used in the operating activities of the segment, tangible fixed assets, assets that are the subject of finance leases, and intangible fixed assets. If a particular item of depreciation or amortisation is included in segment expense, the related asset is also included in segment assets. Segment assets do not include assets used for general enterprise or head-office purposes. Segment assets include operating assets shared by two or more segments if a reasonable basis for allocation exists, including goodwill. 19. Segment liabilities include trade and other payables, accrued liabilities, customer advances. Segment liabilities do not include borrowings, liabilities related to assets that are the subject of finance leases, and other liabilities that are incurred for financing rather than operating purposes. If interest expense is included in segment result, the related interest-bearing liability is included in segment liabilities. The liabilities of segments whose operations are not primarily of a financial nature do not include borrowings and similar liabilities because segment result represents an operating, rather than a net-of-financing, profit or loss. Further, because debt is often issued at the head-office level on an enterprise-wide basis, it is often not possible to directly attribute, or reasonably allocate, the interest-bearing liability to the segment. 20. Measurements of segment assets and liabilities include adjustments to the prior carrying amounts of the identifiable segment assets and segment liabilities of a company acquired in a business combination accounted for as a purchase, even if those adjustments are made only for the purpose of preparing consolidated financial statements and are not recorded in either the parent’s or the subsidiary’s separate financial statements. 21. 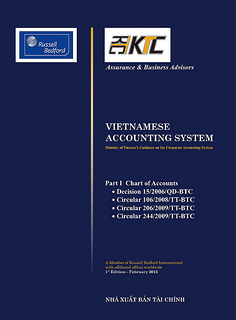 Some guidance for cost allocation can be found in other Vietnamese Accounting Standards. VAS 2 “Inventories” provide guidance for attributing and allocating costs to inventories, and VAS 15 “Construction Contracts” provide guidance for attributing and allocating costs to contracts. That guidance may be useful in attributing or allocating costs to segments. 22. Segment revenue, segment expense, segment assets, and segment liabilities are determined before intra-group balances and intra-group transactions are eliminated as part of the consolidation process, except to the extent that such intra-group balances and transactions are between group enterprises within a single segment. 23. While the accounting policies used in preparing and presenting the financial statements of the enterprise as a whole are also the fundamental segment accounting policies, segment accounting policies include, in addition, policies that relate specifically to segment reporting, such as identification of segments, method of pricing inter-segment transfers, and basis for allocating revenues and expenses to segments. 24. The dominant source and nature of an enterprise’s risks and returns should govern whether its primary segment reporting format will be business segments or geographical segments. If the enterprise’s risks and rates of return are affected predominantly by differences in the products and services it produces, its primary format for reporting segment information should be business segments, with secondary information reported geographically. Similarly, if the enterprise’s risks and rates of return are affected predominantly by the fact that it operates in different countries or other geographical areas, its primary format for reporting segment information should be geographical segments, with secondary information reported for groups of related products and services. (b) if an enterprise’s internal organisational and management structure and its system of internal financial reporting to the the management are based neither on individual products or services or on groups of related products/services nor on geography, the management of the enterprise should determine whether the enterprise’s risks and returns are related more to the products and services it produces or more to the geographical areas in which it operates and, as a consequence, should choose either business segments or geographical segments as the enterprise’s primary segment reporting format. 26. For most enterprises, the predominant source of risks and returns determines how the enterprise is organised and managed.An enterprise’s organisational and management structure and its internal financial reporting system normally provide the best evidence of the enterprise’s predominant source of risks and returns for purpose of its segment reporting. Therefore, except in rare circumstances, an enterprise will report segment information in its financial statements on the same basis as it reports internally to top management. Its predominant source of risks and returns becomes its primary segment reporting format. Its secondary source of risks and returns becomes its secondary segment reporting format. 27. A “matrix presentation” - both business segments and geographical segments as primary segment reporting formats with full segment disclosures on each basis - often will provide useful information if an enterprise’s risks and rates of return are strongly affected both by differences in the products and services it produces and by differences in the geographical areas in which it operates. This Standard does not require, but does not prohibit, a “matrix presentation”. 28. In some cases, an enterprise’s organisation and internal reporting may have developed along lines unrelated either to differences in the types of products and services they produce or to the geographical areas in which they operate. For instance, internal reporting may be organised solely by legal entity, resulting in internal segments composed of groups of unrelated products and services. In those unusual cases, the internally reported segment data will not meet the objective of this Standard. Accordingly, paragraph 25(b) requires the directors and management of the enterprise to determine whether the enterprise’s risks and returns are more product/service driven or geographically driven and to choose either business segments or geographical segments as the enterprise’s primary basis of segment reporting. The objective is to achieve a reasonable degree of comparability with other enterprises, enhance understandability of the resulting information, and meet the expressed needs of investors, creditors, and others for information about product/service-related and geographically-related risks and returns. 29. An enterprise’s business and geographical segments for external reporting purposes should be those organisational units for which information is reported to the management for the purpose of evaluating the unit’s past performance and for making decisions about future allocations of resources, except as provided in paragraph 30.
c) if such an internally reported lower-level segment meets the definition of business segment or geographical segment based on the factors in paragraph 9, the criteria in paragraphs 32 and 33 for identifying reportable segments should be applied to that segment. 31. Under this Standard, most enterprises will identify their business and geographical segments as the organisational units for which information is reported to the management for the purpose of evaluating each unit’s past performance and for making decisions about future allocations of resources. If an enterprise reports its internal segments not along product/service or geographical lines, it will look to the next lower level of internal segmentation that reports information along product and service lines or geographical lines. (b) they are similar in all of the factors in the appropriate definition in paragraph 9. (c) its assets are 10 per cent or more of the total assets of all segments. (c) the remaining segment(s) can be reported as a seprate item. 35. If total external revenue attributable to reportable segments constitutes less than 75 per cent of the total consolidated or enterprise revenue, additional segments should be identified as reportable segments, even if they do not meet the 10 per cent thresholds in paragraph 33, until at least 75 per cent of total consolidated or enterprise revenue is included in reportable segments. 36. The 10 per cent thresholds in this Standard are not intended to be a guide for determining materiality for any aspect of financial reporting other than identifying reportable business and geographical segments. 37. By limiting reportable segments to those that earn a majority of their revenue from sales to external customers, this Standard does not require that the different stages of vertically integrated operations be identified as separate business segments. However, in some industries, current practice is to report certain vertically integrated activities as separate business segments even if they do not generate significant external sales revenue. For instance, Vietnam Oil and Gas Corporation reports its upstream activities (exploration and production) and its downstream activities (refining and marketing) as separate business segments even if most or all of the upstream product (crude petroleum) is transferred internally to the enterprise’s refining operation. 38. This Standard encourages, but does not require, the voluntary reporting of vertically integrated activities as separate segments. 39. If an enterprise’s internal reporting system treats vertically integrated operation activities as separate segments and the enterprise does not choose to report them externally as business segments, the selling segment should be combined into the buying segment(s) in identifying externally reportable business segments unless there is no reasonable basis for doing so. 40. A segment identified as a reportable segment in the immediately preceding period because it satisfied the relevant 10 per cent thresholds should continue to be a reportable segment for the current period notwithstanding that its revenue, result, and assets all no longer exceed the 10 per cent thresholds, if the management of the enterprise judges the segment to be of continuing significance. 41. If a segment is identified as a reportable segment in the current period because it satisfies the relevant 10 per cent thresholds, prior period segment data that is presented for comparative purposes should be restated to reflect the newly reportable segment as a separate segment, even if that segment did not satisfy the 10 per cent thresholds in the prior period, unless it is impracticable to do so. 42. Segment information should be prepared in conformity with the accounting policies adopted for preparing and presenting the financial statements of the consolidated group or enterprise. 43. The accounting policies that the directors and management of an enterprise have chosen to use, in preparing its consolidated or enterprise-wide financial statements, are those that the directors and management believe are the most appropriate for external reporting purposes. Since the purpose of segment information is to help users of financial statements better understand and make more informed judgements about the enterprise as a whole, this Standard requires the use, in preparing segment information, of the accounting policies that the directors and management have chosen. (b) the basis of measurement for this additional information is clearly described. 45. Assets that are jointly used by two or more segments should be allocated to segments if, and only if, their related revenues and expenses also are allocated to those segments. 46. The way in which asset, liability, revenue, and expense items are allocated to segments depends on such factors as the nature of those items, the activities conducted by the segment, and the relative autonomy of that segment. It is not possible or appropriate to specify a single basis of allocation that should be adopted by all enterprises. Allocation of enterprise asset, liability, revenue, and expense items that relate jointly to two or more segments should also be on a reasonable basis. At the same time, the definitions of segment revenue, segment expense, segment assets, and segment liabilities are interrelated, and the resulting allocations should be consistent. Therefore, jointly used assets are allocated to segments if, and only if, their related revenues and expenses also are allocated to those segments. For example, an asset is included in segment assets if, and only if, the related depreciation or amortisation is deducted in measuring segment result. 47. In this Standard, Paragraphs 48-61 specify the disclosures required for reportable segments for an enterprise’s primary segment reporting format. Paragraphs 62-66 identify the disclosures required for an enterprise’s secondary reporting format. Enterprises are encouraged to present all of the primary-segment disclosures identified in paragraphs 48-61 for each reportable secondary segment. Paragraphs 67-76 address several other segment disclosure matters. 48. The disclosure requirements in paragraphs 49-61 should be applied to each reportable segment based on an enterprise’s primary reporting format. 49. An enterprise should disclose segment revenue for each reportable segment. Segment revenue from sales to external customers and segment revenue from transactions with other segments should be separately reported. 50. An enterprise should disclose segment result for each reportable segment. 51. If an enterprise can compute segment net profit or loss or some other measure of segment profitability other than segment result without arbitrary allocations, reporting of such amount(s) is encouraged in addition to segment result, appropriately described. If that measure is prepared on a basis other than the accounting policies adopted for the consolidated or enterprise financial statements, the enterprise will include in its financial statements a clear description of the basis of measurement. 52. The Standard encourgages enterprises provide additional business indicators in order to assess segment performance including: profit or loss from ordinary activities (either before or after income taxes) and net profit or loss. 53. An enterprise should disclose the total carrying amount of segment assets for each reportable segment. 54. An enterprise should disclose segment liabilities for each reportable segment. 55. An enterprise should disclose the total cost incurred during the period to acquire segment assets that are expected to be used during more than one period (property, plant, equipment, and intangible assets) for each reportable segment. 56. An enterprise should disclose the total amount of expense included in segment result for depreciation and amortisation of segment assets for the period for each reportable segment. 57. An enterprise is encouraged, but not required to disclose the nature and amount of any items of segment revenue and segment expense that are of such size, nature, or incidence that their disclosure is relevant to explain the performance of each reportable segment for the period. 58. Items of income or expense within profit or loss from ordinary activities are of such size, nature, or incidence that their disclosure is relevant to explain the performance of the enterprise for the period, the nature and amount of such items should be disclosed separately. Paragraph 57 is not intended to change the classification of any such items of revenue or expense from ordinary to extraordinary or to change the measurement of such items. 59. An enterprise should disclose, for each reportable segment, the total amount of significant non-cash expenses, other than depreciation and amortisation for which separate disclosure is required by paragraph 56. 60. An enterprise that provides the segment cash flow disclosures as required by VAS 24 "Cash Flow Statements" need not also disclose depreciation and amortisation expense pursuant to paragraph 56 or non-cash expenses pursuant to paragraph 59. 61. An enterprise should present a reconciliation between the information disclosed for reportable segments and the aggregated information in the consolidated or enterprise financial statements. The reconciliation contains a seprate column for information not belonging to the reported segments. In presenting the reconciliation, segment revenue should be reconciled to enterprise revenue from external customers (including disclosure of the amount of enterprise revenue from external customers not included in any segment’s revenue); segment result should be reconciled to a comparable measure of enterprise operating profit or loss as well as to enterprise net profit or loss; segment assets should be reconciled to enterprise assets; and segment liabilities should be reconciled to enterprise liabilities. (c) if an enterprise’s primary format is geographical segments based on the location of its customers (where its products are sold or services are rendered), the required secondary-format disclosures are identified in paragraphs 64 and 66. (c) the total cost incurred during the period to acquire segment assets that are expected to be used during more than one period (tangible fixed assets, intangible fixed assets and other non-current assets) by geographical location of assets, for each geographical segment whose segment assets are 10 per cent or more of the total assets of all geographical segments. (c) the total cost incurred during the period to acquire segment assets that are expected to be used during more than one period (tangible fixed assets, intangible fixed assets and other non-current assets). 65. If an enterprise’s primary format for reporting segment information is geographical segments that are based on location of assets, and if the location of its customers is different from the location of its assets, then the enterprise should also report revenue from sales to external customers for each customer-based geographical segment whose revenue from sales to external customers is 10 per cent or more of total enterprise revenue from sales to all external customers. (b) the total cost incurred during the period to acquire segment assets that are expected to be used during more than one period (tangible fixed assets, intangible fixed assets and other non-current assets) by location of the assets. 67. If a business segment or geographical segment for which information is reported to the board of directors and chief executive officer is not a reportable segment because it earns a majority of its revenue from sales to other segments, but nonetheless its revenue from sales to external customers is 10 per cent or more of total enterprise revenue from sales to all external customers, the enterprise should disclose that fact and the amounts of revenue from sales to external customers and internal sales to other segments. 68. In measuring and reporting segment revenue from transactions with other segments, inter-segment transfers should be measured on the basis that the enterprise actually used to price those transfers. The basis of pricing inter-segment transfers and any change therein should be disclosed in the financial statements. 69. Changes in accounting policies adopted for segment reporting that have a material effect on segment information should be disclosed, and prior period segment information presented for comparative purposes should be restated unless it is impracticable to do so. Such disclosure should include a description of the nature of the change, the reasons for the change, the fact that comparative information has been restated or that it is impracticable to do so, and the financial effect of the change, if it is reasonably determinable. If an enterprise changes the identification of its segments and it does not restate prior period segment information on the new basis because it is impracticable to do so, then for the purpose of comparison the enterprise should report segment data for both the old and the new bases of segmentation in the year in which it changes the identification of its segments. 70. Changes in accounting policy should be made only if required by statute, or by an accounting standard-setting body, or if the change will result in a more appropriate presentation of events or transactions in the financial statements of the enterprise. 71. Changes in accounting policies adopted at the enterprise level that affect segment information should be applied retrospectively and that prior period information be restated unless it is impracticable to do so. If this treatment is followed, prior period segment information will be restated. 72. Some changes in accounting policies relate specifically to segment reporting. Examples include changes in identification of segments and changes in the basis for allocating revenues and expenses to segments. Such changes can have a significant impact on the segment information reported but will not change aggregate financial information reported for the enterprise. To enable users to understand the changes and to assess trends, prior period segment information that is included in the financial statements for comparative purposes is restated, if practicable, to reflect the new accounting policy. 73. Paragraph 68 requires that, for segment reporting purposes, inter-segment transfers should be measured on the basis that the enterprise actually used to price those transfers. If an enterprise changes the method that it actually uses to price inter-segment transfers, that is not a change in accounting policy for which prior period segment data should be restated pursuant to paragraph 69. However, paragraph 68 requires disclosure of the change. 74. An enterprise should indicate the types of products and services included in each reported business segment and indicate the composition of each reported geographical segment, both primary and secondary, if not otherwise disclosed in the financial statements or elsewhere in the financial report. 75. To assess the impact of such matters as shifts in demand, changes in the price of inputs or other factors of production, and the development of alternative products and processes on a business segment, it is necessary to know the activities encompassed by that segment. Similarly, to assess the impact of changes in the economic and political environment on the risks and rates of returns of a geographical segment, it is important to know the composition of that geographical segment. Previously reported segments that no longer satisfy the quantitative thresholds are not reported separately. They may no longer satisfy those thresholds, for example, because of a decline in demand or a change in management strategy or because a part of the operations of the segment has been sold or combined with other segments. An explanation of the reasons why a previously reported segment is no longer reported may also be useful in confirming expectations regarding declining markets and changes in enterprise strategies./.